Old Crippled Men: Get Your Lie Straight Fantasy Records! Get Your Lie Straight Fantasy Records! I hope no one is taking for granted these soul/funk compilations that are coming out from labels concerned with music that's been lost, just because they're released almost weekly. Labels do the work for us, presenting deep cut gems from forgotten seven inches and under-produced-in-quantity LPs. 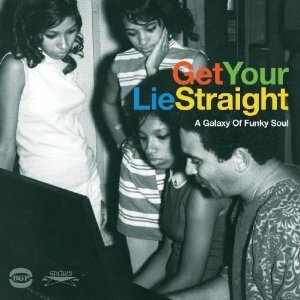 This particular compilation of Galaxy Records' soul men and women was re-released under the name "Get Your Lie Straight" in 2004. It was directly named after Bill Coday's track of the same name, but also probably named after Fantasy Records, the major label of which Galaxy Records is a subsidiary throughout the 60s, 70s, and early 80s, and their tragic mistake of keeping the primarily black musicians from Galaxy on the back burner. This "much-maligned black music subsidiary" of Fantasy records pumped out hot R&B tracks one after another in the late 1960s and got no advertising or credit while the parent label made big bucks on CCR and other cash grabs (certainly no offense to CCR here). Re-released under this collection by a label called Beat Goes Public, as the last chronological release of a triumvirate, it stands as a testament to artists forgotten, after being given little chance by their label for lasting success. Artists like Loleatta Holloway, JJ Malone, and Lenny Williams are dusted off from the washy back catalogue of American soul for your listening pleasure. Get it in the comments while it's hot! Good point, kevinass. Such a bummer, that label.